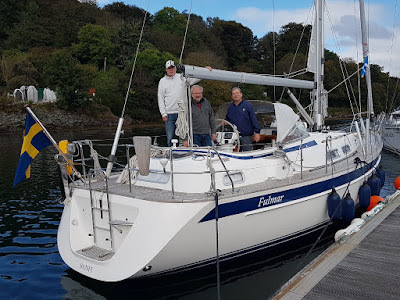 To finish a busy year for our brokerage service yesterday saw the immaculate Hallberg-Rassy 37 'Fulmar' depart Ardfern heading back to Sweden with her new owners. Listed for sale following an extended period of lay-up the boat was launched from her long term home at Creran Marine and brought to Ardfern while our workshops worked through a short post-survey snagging list getting her ready for a North Sea crossing later next week. 'Our brokerage business has seen a prolonged period of steady growth for the last 4 years. Vendors based on the west coast of Scotland are now aware that with the developments in online advertising and engaging a pro-active broker it no longer requires the boat to be located on the Clyde as was previously the case to achieve a quick sale. As independent brokers we have been working to establish a network of connections in other independent brokerages around Europe to ensure we can offer the best possible service for clients not only selling their own boats but also those looking for their next boat. 'Fulmar' is a great example of the benefits collaborative approach. This is the second boat this year which we have sold to Swedish buyers through our established connection Tobias and his team at Navark Yacht Brokers in Helsingborg. We achieved a quick sale at the very top end of the price range for the model and were able to use our full service facilities to accommodate the installation of new equipment prior to the boats departure. commented Ardfern General Manager and resident ABYA Broker Mark Cameron. Thinking of buyer or selling a boat this autumn?